See that you are visiting Paris. In NYC, after our Labor Day, most women stop wearing pastel colors and turn to black. Since black no lingering suits me, I wear navy. What is your Summer/Autumn transition wardrobe? Can you post a few ideas on your blog? I agree that with so many beautiful autumn colors around it is a little early to succumb to winter black. With so much color inspiration from the autumn windows at Hermes, your request dear Cynthia could not have come at a better time! 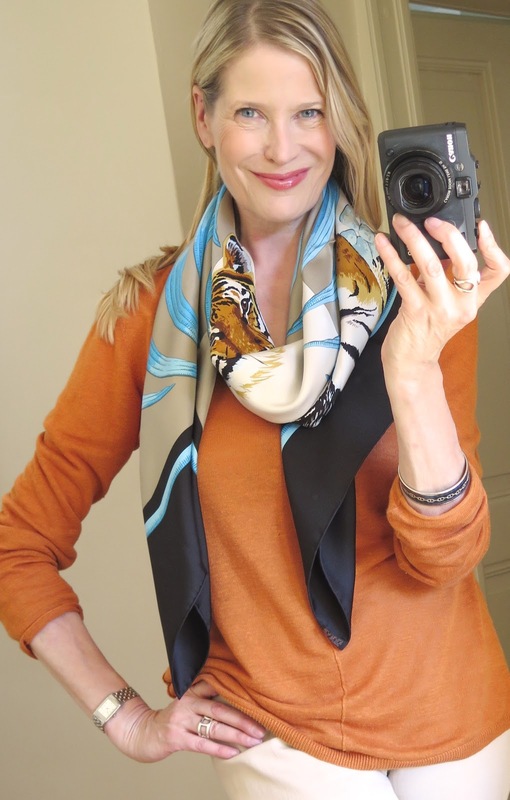 Many of the combinations resonate with some of my favorite autumn scarves, and remind me of previous ways of wearing them.. Looking at the date of some of these pics, I'm thinking how timeless a simple capsule wardrobe with beautiful accessories can be. The windows also inspired some new looks and reminded me of other locations and photos. Because there are so many, there will be a part two as well. The picture below is from 2014, and incidentally part of a style challenge (how to wear leopard print.. click here to see the full post). 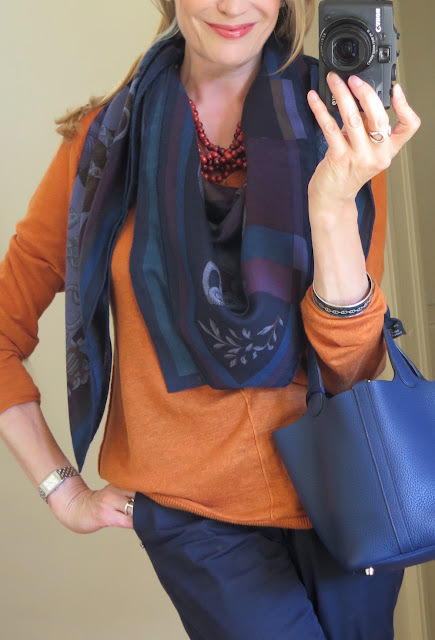 Wearing a 'Carré en Carré' 90 scarf in a rectangular pleated fold, secured in a vertical basic slide with a shawl ring in horn (click here for a how-to). Below the same scarf worn in the same year, but this time tied into a criss-cross bow knot with a Grande Classique dark Mother of Pearl scarf ring), and teamed with a dark brown jersey shirt, checked wool pants and a 32 Kelly in ebene. The look itself is a repeat of my first blog post in 2009 (click here to see the full post). As usual, I toasted Paris good-bye in the bar of the train station's magnificent Train Bleu restaurant, only this time I had an orange bag as extra company! Inside the orange bag.. Tigre Royal! I've been looking for a 140 x 140 cm (55"x55") carré géant for the longest time, and this one was love at first sight (Ref. H671632S CW12 noir/argile/turquoise .. available here on H's French site). Even though it's from the current Autumn/Winter collection, it can be worn in a light and summery way too...up until the last couple of days it has been sunny and warm in the South of France, so I wore it for its first outing with cream trousers. More on the Tigre Royal coming soon! I tend to get quite absorbed while taking pictures of the FSH windows... zooming in and out of them, the colors and textures seem to imprint themselves on my subconscious... I often recognise them afterwards in a myriad different contexts and atmospheres - nature, buildings, someone's clothing, a scarf or piece of jewelry or even another shop window. I came past this beautiful board game at 12 Rue des Saint Pères... home to Galerie Ducha, where Master engraver Dominique Duchange gives a new life to centuries old paper board games (www.dducha.com). Combining the trousers from look #2, the scarf from look #3 and the sweater from look#4 with a MaiTai Collection fox fur collar in mocca (available here). Pic also from 2014! Ravishing, dahlink! I would like one of everything. Could you please pack it all up and send it to me? But, before you do that, please have everything altered to fit a size 10. Those itty-bitty size 4's you wear will never do. Seriously, you look beautiful in these autumn shades, and the blue and orange is particularly striking. You look 1000% better than those darn windows! Did you start spending Meryl’s fortune? Size 4? didn’t see it in my closet since ages…too much chocolate probably! Catherine, I wasn't a size 4 when I was born! And, yes, I hacked Meryl's account - woo hoo . . . free Birkins for all the Swans. Your autumn inspired outfits are always my favorites. Thank you for sharing your find about the board games! It's hard for me to tell on my tiny phone display, are they low tables? How cool would they be as a coffee table. With the surface protected of course! Um, yes please! Thanks for the inspiration. That Tigre Royal looks fantastic! I have also looked at several scarves from the men's collection. They are definitely several that would be equally wearable for women. Worth a look! Like Cynthia, I'm wearing more navy, so thanks for the inspiration! And you've given me some great ideas for wearing my burnt orange Waterfall necklace too! And the timing is perfect because I've recently gotten a leopard cardigan & shell/vest, so I'm going to have fun wearing them with the burnt orange Waterfall necklace & autumn-toned scarves with my MTC rosewood scarf rings. And my Double Anneau necklaces are great with Fall & Winter layers! Thanks for your beautiful collection & styling ideas! 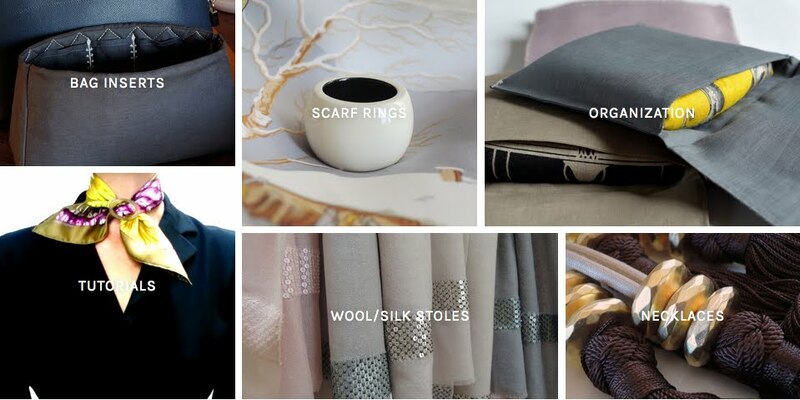 I enjoy reading your styling posts, ever since a child, I've had a thing about scarves. I still wear a scarf at least 4 times a week when I go out. Love the magnet idea. You are the ultimate proof of timeless fashion! And I agree, warm autumn colours are one of my favourites, too. So I'm waiting for your beautiful yellow skirt to have an outing soon again- inspired by the riding boots (which will never fit my calves). Quite funny, just yesterday I was browsing through all the scarves in desperate hope to finally find one I really love- and stopped at the tigre royal. The modelling picture didn't convince me at all- but yours does!! Congratulations to this beautiful addition. Looking forward to part II! Loving these looks and the xtra helpings on MaiTai in mid-season Autumnal Form...I have a notion of those hair down selfies shot just after slipping out of rain hat with that Joe Cocker 9 1/2 Weeks song blaring. The best posts are those of you wearing H scarves. Love all the pictures and the way you present them. Congrats on the Tigre Royal. It is very beautiful and I do look forward to the many possibilities of wearing it. Have a wonderful weekend, Dearest. Great to see another Reader's Challenge post, dear MT! Love Tigre Royal, it'll be so fun to see what you do with it. The orange and royal blue pairing is stunning! Happy weekend to you and all the swans! We're waiting for a big storm to hit this weekend. Fingers and toes, as Faux Fuschia would say -- hoping all our trees stay put! OH THAT TRAIN STATION restaurant I have NEVER been TOO!Perhaps we can meet there one day!I hear there is a CAT that LIVES THERE! I definitely want a HORN RING to hold a scarf.Sent you an email the other day think I may have ended up in your SPAM again! So pretty. Love the fur collar idea. So creative!